Ever since those poppies flourished in Flanders' Fields after the Great War, the question has been: how do we remember and respect those that died adequately enough, when the loss is so great and our regret even greater? My answer is not to avoid the need for remembrance at all, but to halt the mass patriotic and nationalist commemoration of WWI, and all war since, that grows year on year. Instead, we should focus sharply on the deep regret that we allowed ourselves to be pushed into a war of empires by the upper echelons of our society, by those that ruled us, by the establishment. At a time when our nuclear programme and excessive defensive spending has finally come into common question, remembrance was yet again used to play on people's sympathies and upset, as the UK's defence chief announced his fear at any power Corbyn may hold in future, which may involve NOT pushing a button that destroys a substantial proportion of humanity. (Imagine?!) Fear at getting rid of the most fearsome weapon ever created on British soil? And we now have a Prime Minister who has confirmed that she wouldn't hesitate to "press the button" if it were deemed necessary. It seems to me that the annual event has increasingly become an exercise of justification of war and a patronising, false expression of gratitude towards the fallen and their families; from an establishment still unwilling to fully accept guilt for the ill-fated invasion of Iraq- instead praising the service men and women who died as "heroes". It's a bit sick really. Those at the top are still using this most solemn of days to excuse our military campaigns and create deference for the actions of our armed forces. Don't jump up and claim the moral high ground of deference and respect whilst the established powers in our country are misusing the emblem in order to justify today's wars. This was highlighted no better than last year's papers which chose to criticise Corbyn for "not bowing low enough" and, more revealingly, being criticised for regretting the deaths of soldiers from other nations as well as "our own". This is quintessential of the nationalism and pride element that surrounds modern remembrance day, which has largely become a commemorative, brash show of military pride and swagger. It seems to me that the mantra of "never again" that once surrounded Remembrance Sunday has long been forgotten. Huge commemorative ceremonies now take place, people who kill others are treated as heroes and nationalism has again taken over. It is used as a tool to remind the people that one day, their "duty" may be called upon to fight for "their country". 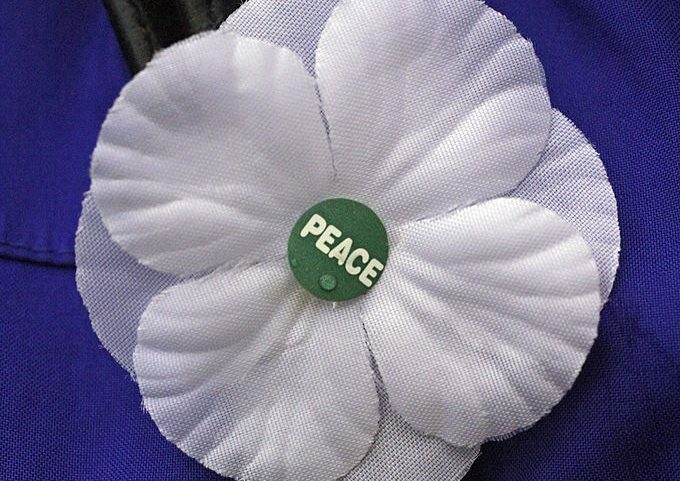 In order to reinstate "never again" as the primary focus of Remembrance I feel a message needs to be sent to our military and our governments- and for me, a White Poppy demonstrates a desire for a new direction and protests the military dominance of Remembrance ceremonies. Instead of merely mourning and showing respect for those that died, as we should, we should challenge and question the wars on terror that have had no desirable effect and achieved precisely nothing except the utter collapse of a region which sometimes appears irreparable. It would seem apt, to me, that on this year, when the long-awaited Chilcot enquiry finally confirmed the conclusion we'd all pretty much come to before it had begun, we should choose to take an apologetic, mournful approach to remembrance. I see it as an insult to constantly label soldiers as having "died for us" when, in recent times, they have quite clearly died for no good cause at all and at times- as seen in Iraq- due to inadequate protection in a warzone. The state should be made to apologise, instead of rallying patriotism and a misplaced sense of pride in our military's actions. After WWI, the world had woken up to the fact that the mass killing and war that whole nations had subscribed to had nothing to do with defending ourselves against evil but that our differences nationally were a pretence, pushed by the establishments in our different nations so that they could gain greater control. Wilfred Owen, himself a victim of war, illustrated this better than anyone. The reason why the regret was so big was, essentially, because these men had died for no purpose other than to serve the battles of competing colonial nations and, after the scale of the casualties became apparent in the wars latter years, the establishments realised they had gone too far. This, I believe, is why these commemorations each year are so grand, to try and develop the idea that these men, many of them boys, died for us. And it is a very useful exercise for our establishment, when war crimes are becoming apparent, to put today's wars in the same place as the old, to justify them with the same rhetoric as before, portraying their unnecessary loss as some kind of sacrifice for the state. "Died for us" said nobody, ever, in the 1920s. "Died for us" said everyone, by 2000. The red poppy symbolises, to me, the growth of Remembrance in terms of respect for sacrifice for causes far from noble; the white, shows a greater respect for the peace. JM Keynes once referenced the "Economic consequences of Peace" in a book which backs up the truth that many wars are economic and social necessities for establishments, not for the people. Governments are meant to serve people, not the other way around. There was no sacrifice, only unnecessary death in WWI- and we see again, today, that needless and counter-productive conflicts are again rising as the default method of resolving international issues by many Government. I, for one, shall not be party to an exercise that excuses these unnecessary wars as some kind of noble sacrifice; I will instead demand that we change the emphasis of our mourning. We cannot allow them to again enlist our young into defending their interests for fighting their battles to support their objectives. So what I'm saying is: remember and mourn for war, yes, but do not, in any way, allow it to become a commemorative and emotive exercise that fuels nationalist desires. A white poppy, instead of remembering the men in terms of their "sacrifice", remembers the original post-WWI consensus: that what happened was wrong, that we deeply regret their deaths, and that we should never allow ourselves to be pushed into needlessly destroying one another again. It's 2016; let's teach children about how to form peace, not how to fight. Let's teach about the times when humanity has worked together, not against itself. And for the sake of decency, let's praise and remember those who make their self-sacrifice in the name of peace, rights and for the good of humanity, not whilst killing other people.